Let’s start digging … up dinner that is! This one hour interactive virtual fieldtrip will have students discovering the science behind growing plants. Students will work with a flight director to conduct a soil experiment, examine the different ways plants can grow (under, along, or above the ground), prepare dinner from our family garden, and peek inside a farmer’s market to see the complete farm to table process. 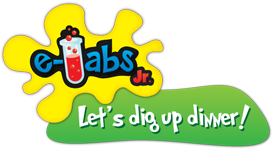 Students will be asked to collaborate with their classmates in order to make observations, predict outcomes, complete lab journal, as well as, ask and answer questions.